Maybe include breaking the glass and have a kiddush cup filled with grape juice instead of wine because drinking alcohol can be viewed as haram (against the religion) in Islam. 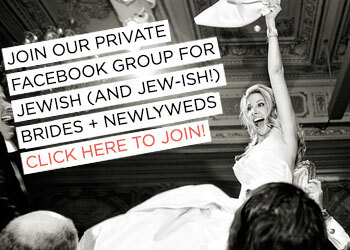 What about having kippot (yarmulkes) available for whoever wants to wear one for the ceremony? 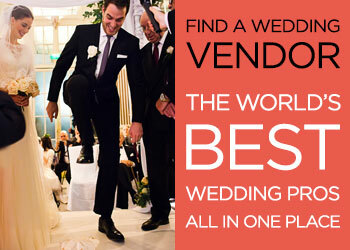 If the logistics are too intimidating, then you can always have two wedding ceremonies back to back that include all the traditions that matter to you but still have one glorious moment at the end when you can walk out together as husband and wife. 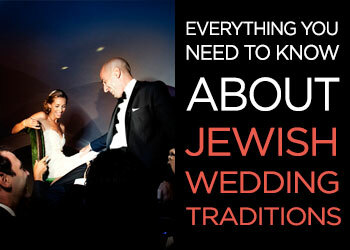 You can still keep some Jewish traditions mixed with any other faith such as having your parents walk you down the aisle, and getting married under a chuppah structure. 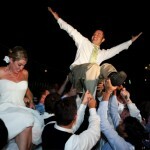 Maybe include the Hora — this works extremely well as it actually has no religious significance at all and is just a really fun way to get everyone on the dance floor. 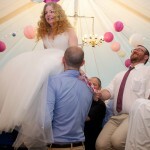 It’s one of those traditions that even the non-Jewish guests at the wedding will probably have seen before as it’s so popular in films and always makes you want to have a go… who doesn’t want to be lifted up on a chair in a crowd of partying friends? 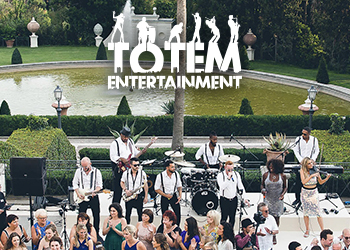 A wedding program is also a great idea, as it allows everyone of your guests to understand the pieces and parts of the ceremony and celebration as a whole. 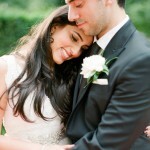 Karen’s written a post here about writing and creating a wedding program if the idea appeals. I recommend reading a fabulous book by Rabbi Devon A. Lerner called Celebrating Interfaith Marriages: Creating Your Jewish/Christian Ceremony . 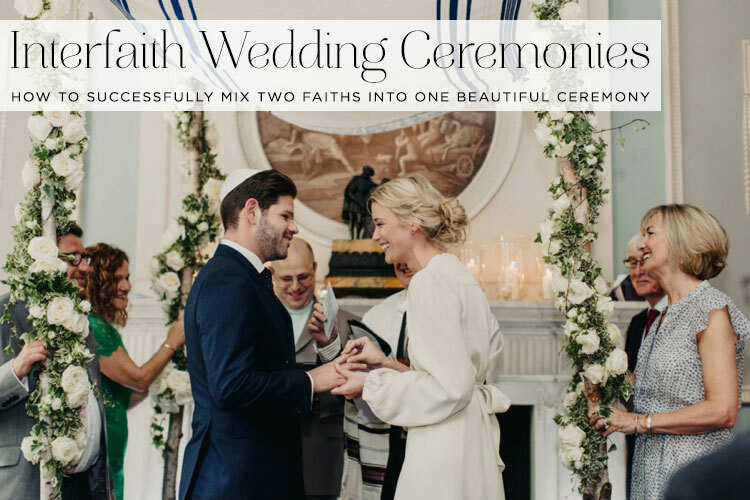 It really discusses some of the challenges couples planning a mixed faith wedding have, and puts forward some great solutions. I’ve used some of the wonderful advice in this book myself when planning interfaith ceremonies. 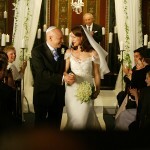 Ultimately, whether you enjoy a sake ceremony in your Japanese tradition under a Chuppah for your Jewish groom or exchange the Greek stephana (wedding crowns) and recite the Jewish seven blessings , the underlying premise is respect. 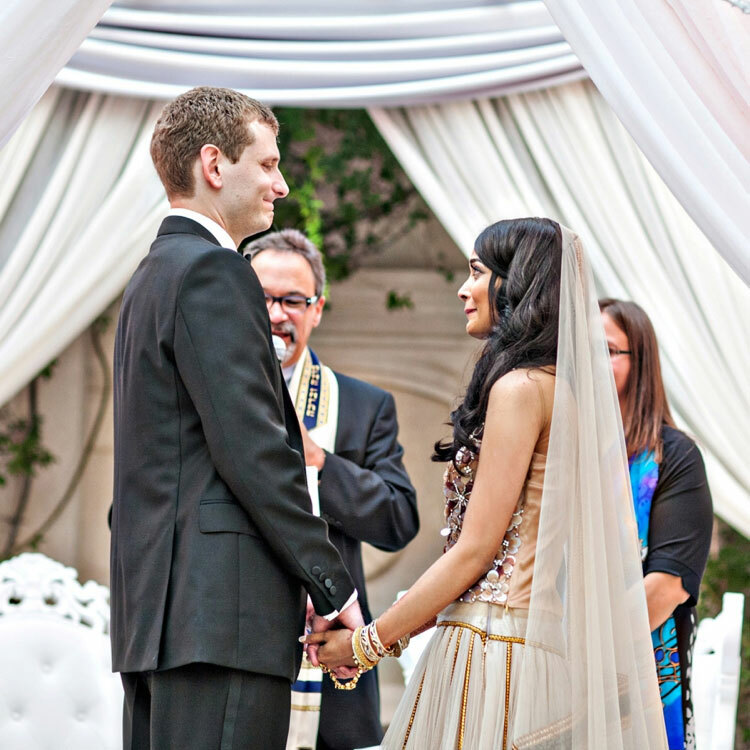 Respect is the foundation of interfaith, intercultural marriages. Love is the bridge. I hope this helps to remind you that anything is possible — it’s your ceremony and you are absolutely entitled to have an individual and meaningful ceremony that incorporates both of your faiths. 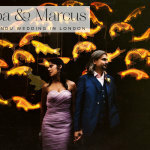 Lisa Johnson is one half of Carmela Weddings, a wedding planning company she runs with her husband, creating stylish, unique weddings for fashion-forward couples in London and the South East. 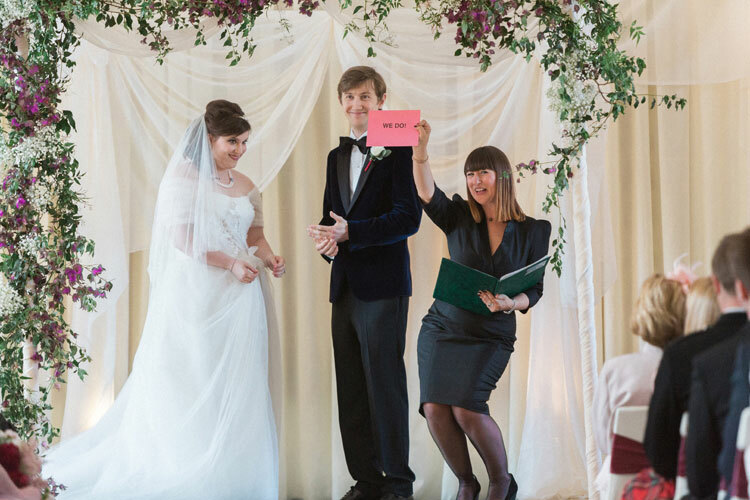 She is also an independent celebrant writing and conducting wedding ceremonies and vow renewals throughout the UK and abroad and is a member of the UK Alliance of Wedding Planners as well as the UK Society of Celebrants. When not immersed in the world of weddings, you’ll find her travelling the globe or running around after her 4 year old twin sons. 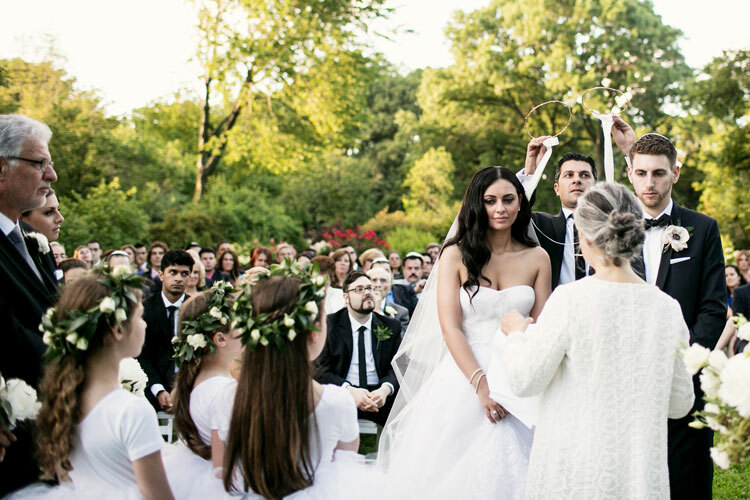 Ah, the wonderful Francesca and Andrew’s ceremony! 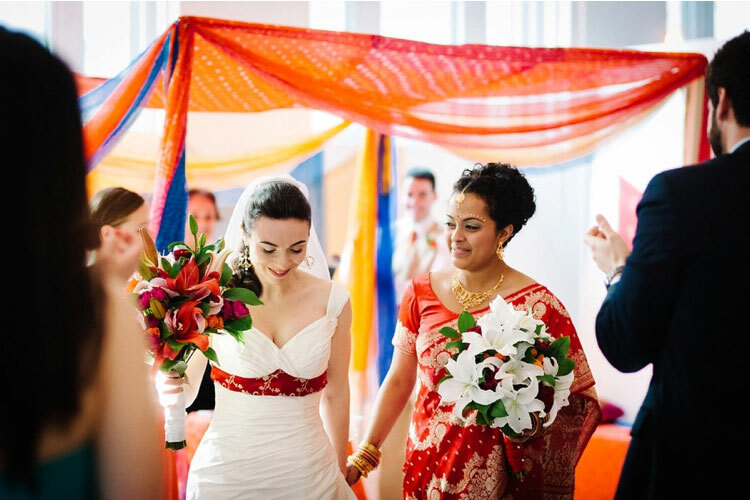 We incorporated some beautiful traditions from both of their heritages and together we all celebrated what we had in common as opposed to our differences. Which are actually few and far between. 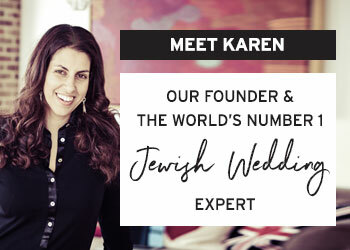 Great article Karen, I couldn’t agree more that there is a lot of depth and pleasure to be gained in a multi-faith ceremony. Couldn’t agree more with everything you say, Zena! And yes, the differences ARE always so few and far between. My husband And I decided to have two separate ceremonies, one day after the other. He is Hindu and I’m an Episcopal priest. We wanted to enjoy the fullness of each other’s traditions but made small changes to both to make them authentic for us and more accessible to our guests. For the Christian service we made some changes to the wording and for the Hindu service we hired a priest who took the time to explain in English the significance of each part of the ceremony before it took place. This is important because it is all chanted in Sanscrit.